The landmark dirigible hangar at Moffett Field in Mountain View, which the trust called "a stunning piece of California's aviation history," also made the list. 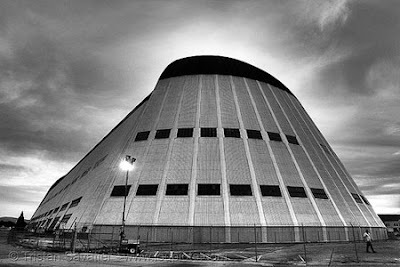 The hangar, a giant domed structure 200 feet high, is in danger of demolition because it contains toxic substances like PCBs and asbestos, and the substances are leaking into nearby water. The hangar was built to house giant Navy airships in the 1930s. It is owned by NASA, which took over the former Moffett Naval Air Station. However, the Navy is required to clean up the toxic materials, and two years ago the Navy proposed tearing down the structure.